The lymphatic system is the base of the IMMUNE SYSTEM and effects the homeostatic system by maintaining the correct environment for all cells to thrive. It is the purification and oxygen delivery system on the cellular level. Therefore, it affects everything in the body. 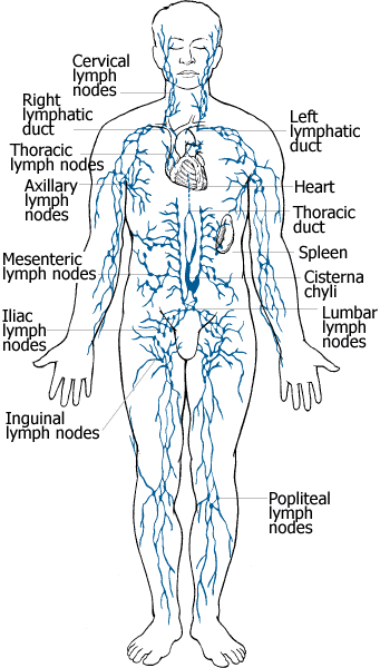 "The lymph system is a network of organs, lymph nodes, lymph ducts, and lymph vessels that produce and transport lymph from tissues to the bloodstream. The lymphatic system contains immune cells called lymphocytes(T-cells), which protect the body against antigens (viruses, bacteria, etc.) that invade the body. Lymphnodes produce immune cells that help the body fight infection. They also filter the lymph fluid and remove foreign material such as bacteria and cancer cells. When bacteria are recognized in the lymph fluid, the lymph nodes produce more infection-fighting white blood cells, which causes the nodes to swell." "Injuries, immobility, poor diet, dehydration, pathogens, surgery, physical and emotional stress, hormone imbalances, environmental toxins and the normal aging process are all contributing factors to lymph congestion." The B.E.L.D.™ System utilizes a "Light Wand" that is most efficient in breaking down protein blockages (which cause discomfort, disease, and death) by eliminating Hypoxia, which is a severe lack of oxygen at the cellular level. It is created specifically for the lymphatic system and is state of the art for lymphatic cleansing and is compatible with all healing modalities. Cleansing the Lymphatic System using the B.E.L.D.™ System is the easiest way to address the protein blockages where every disease known is caused by these protein blockages in the Lymphatic System. The L.E.D. Light technology in B.E.L.D.™ Lymphatics actually works on the cellular level, thus removing the protein blocks all together. Fifteen years of B.E.L.D.™ research have proven that by using the B.E.L.D.™ Lymphatics protocol, the elimination process of the large intestine is accelerated three to five times faster. Acquaint yourself with the Bio-Photonic Energy Lymphatic Drainage treatments and experience the activation of "The Fountain of Youth Within Us All!" Can the B.E.L.D.™ System be used on children? Yes. Children respond to treatments faster than adults do. With children, not teenagers, their time frame is usually much less than an adult because they ordinarily have not developed all the toxic issues found in an adult’s body. Treatments should be spaced out minimally every 48 hours. Other modalities such as dry skin brushing, epsom salt baths, and rebound exercising may be done inbetween. We use a full spectrum L.E.D. (Light Emitting Diodes) proprietary technology wand to remove Blood Protein Blockages, both at the surface and deep within the tissues and linings of our organs. Surface lymph arteries account for 70% and are close to the surface of the body while 30% are deep within the linings and tissues of our organs.These photon lights are placed on major lymph drainage points of the entire lymphatic system throughout the body to break down blood protein blockages, feed the cells with oxygen, nutrients and hormones and strengthen the immune system. The Lymphatic cleansing program can reduce the healing time by 50% or more by consistently using our system. The cleansing techniques using this technology are themselves cutting edge and a new paradigm. L.E.D. releases energy in the form of photons (units of light). 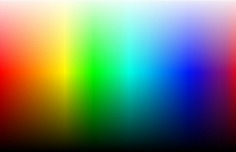 The colour of the light corresponds to the energy of the photon. The L.E.D. 's release energy in the form of wavelengths of light that stimulate cells to promote healing. Cleanses cells protein blockages to provide the proper balance for potassium(inside cells) and sodium(outside cells). The frequency used is non invasive. The sessions are pain free and relaxing. After your Session: Clients may continue to feel relaxed for a few hours after the appointment. There may be more volume when urinating and more frequent bowel movements. Urine may have a stronger odor, different color and be foamy or filmy. It is important to drink more water than normal to assist the cleansing. 5-10 sessions are recommended depending on the seriousness of the congestion. Serious conditions should consider treaments up to 3x per week, moderate cases 1x per week until symptoms return to normal, for prevention or relaxation 1x every 4-6 weeks. For maximum benefits of a lymphatic cleansing, we recommend it be followed with Colon Hydrotherapy. This helps in better cleansing by first breaking up toxins and then eliminating them from your body. Combining Colon Hydrotherapy and Lymphatic Drainage will enhance your cleansing experience! Disclaimer: Contents of this site is for information purposes only. It is not intended to diagnose, treat, or cure any disease or condition, nor should it take the place of medical advice or treatment.